(TibetanReview.net, Sep17, 2015) – A 22-year-old Tibetan woman named Dekyi Dolma was reported to have carried out a lone protest against Chinese rule in Ngaba (Chinese: Aba) County-town of Sichuan Province on Sep 13, making her the eighth such protester over the past less than two months. She shouted slogans calling for an end to oppressive Chinese policies in the region, reported Radio Free Asia (Washington) Sep 15. “She did it knowing full well about the huge presence of Chinese security personnel in the area,” the report quoted an unnamed local source as saying. It added that she was roughed up and taken away by Chinese police shortly afterwards. Many Tibetans were reported to be in town at the time and they raised cries expressing support for the woman and anger over the police roughing-up of a peaceful protestor. Ngaba town was already under severe security clampdown due to frequent Tibetan protests over the past many years. 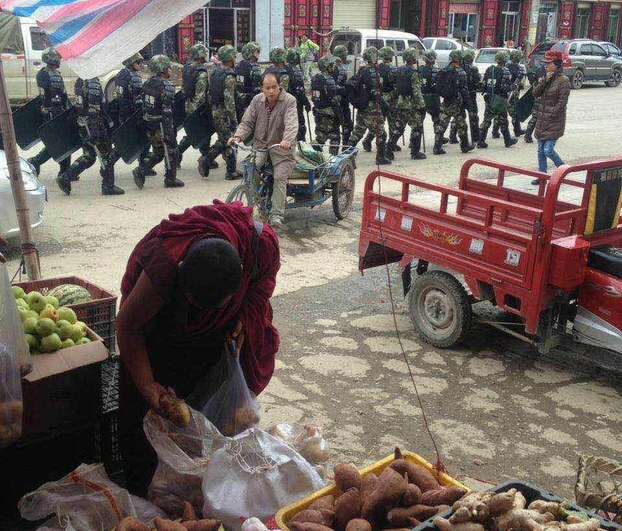 Due to overwhelming Chinese security measures, which made any organized protest impossible, the area has seen a series of protests by lone Tibetans, many of them monks and young women, in recent weeks. Earlier, on Sep 10, 20-year-old monk Lobsang Dagpa, also known as Adrak, of the local Kirti Monastery shouted for freedom for Tibetans as he staged a lone protest in the county’s main town. Other Tibetans who witnessed the incident also raised cries in his support and there was an unconfirmed report of a clash with Chinese police, leading to many possible arrests. The monk originally belongs to the county Suruma Township. On the same day, a monk named Lobsang also carried out a lone protest in Ngaba County-town around 6:00 pm. He too shouted for freedom for Tibetans and also prayed long-life for Tibet’s exiled spiritual leader, the Dalai Lama. Chinese police took him away as soon as they saw him protesting and also possibly some lay Tibetans who protested his detention. Earlier, on Sep 9, Chinese police took away 21-year-old Kirti monk Jampel Gyatso, after he carried out a lone protest on the Dzongkar Street in Ngaba County. He carried a large portrait of the Dalai Lama over his head and called for freedom in Tibet while protesting.